Several neuroanatomic and physiologic theories state that nociceptive dorsal horn and brain stem neurons receive convergent inputs from various tissues. Therefore, higher centres cannot identify correctlythe actual input source. Most recently, the models have included newer theories in which plasticity of dorsalhorn and brainstem neurons plays a central role. During the past decades, a systematic attempt to chart referred musculoskeletal pain areas in humans has been made. This is the most acceptable explanation in which the pain is caused by meeting the afferent information of the visceral organs and those of somatic origin on the same segment. This causes hyperreactivity of the dorsal horn neurons which is interpreted as coming from the same dermatom. The pain is derived from a different area then the pain area. Common cause of referred pain are pain radiating from; a spine, sacroiliacal joint, viscera, tumors, infections or from associated manifestations. 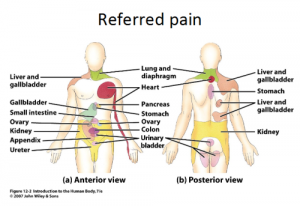  Size of referred pain is related to the intensity and duration of ongoing/evoked pain.  Temporal summation is a potent mechanism for generation of referred muscle pain.  Central hyperexcitability is important for the extent of referred pain.  Patients with chronic musculoskeletal pains have enlarged referred pain areas to experimental stimuli. The proximal spread of referred muscle pain is seen in patients with chronic musculoskeletal pain and very seldom is it seen in healthy individuals.  Modality-specific somatosensory changes occur in referred areas, which emphasize the importance of using a multimodal sensory test regime for assessment. Advantages and disadvantages of intramuscular infusion of hypertonic saline. Also other alogenic substances such as bradykinin, serotonin, capsaicin and substance P can be used to cause referred pain. 1. The variation in the number of structures (skin, subcutis, fascia, muscle, tendons, ligaments, and bone) that is anesthetized. This is the most important criteria, because referred pain areas and, especially visceral referred pain, are commonly found to be located in the deep tissues in which complete anaesthesia of a referred pain area is difficult. 4. Whether sensory changes (hypersensitivity) occur at the referred pain site. Also the applying of an eutectic mixture of local anesthetica on the skin, just above the referred pain area, reduced the referred pain intensity with 22.7%. (Grade of recommendation B) A similar result was found after that ethyl chloride was sprayed onto a saline-induced referred pain area. The pain that comes with myofascial pain syndrome is referred pain. So this is a therapy to treat the referred pain that causes the myofascial pain syndrome. Alvarez D.J. et al, Trigger points: Diagnosis and Management, Am Fam Physician, 2002, 15, 65, p. 653-660. Babenko V. et al, Experimental human muscle pain and muscular hyperalgesia induced by combinations of serotonin and bradykinin, Pain 1999, 82, p. 1-8. Edwards J. et al, Superficial dry needling and active stretching in the treatment of myofascial pain, Acupunct med, 2003,21,p. 80-86. Graven-Nielsen T. et al, Stimulus-response functions in areas with experimentally induced referred muscle pain- a psychophysical study, Brain Res, 1997, 744,p. 121-8. Graven-Nielsen T. et al, Quantification of local and referred muscle pain in humans after sequential i.m. injections of hypertonic saline, Pain 1997,69, p. 111-7. Han S.C. et al, Myofascial pain syndrome and trigger-point management, Reg Anesth, 1997, 22, p. 89 -101. Ilbuldu E. et al, Comparison of laser, dry needling, and placebo laser treatments in myofascial pain syndrome, Photomed laser surg, 2004, 22, p.306-311. Jensen K. et al, Pain and tenderness in human temporal muscle induced by bradykinin and 5 hydroxytryptamine, Peptides, 1990 , 11, p. 1127-32. Kalichman L. et al, Dry needling in the management of musculoskeletal pain, JABFM, 2010, 23, p. 640 -646. Laursen R.J. et al, Quantification of local and referred pain in humans induced by intramuscular electrical stimulation, EurJ Pain, 1997, 1, p.105-13. Laursen RJ et al., Referred pain is dependent on sensory input from the periphery: a psycophysical study, Eur J Pain, 1997, 1, p 105-13. Laursen R. et al, The effect of compression and regional anaesthetic block on referred pain intensity in humans, Pain, 1999, 80, p.257-63. Marcgettini P et al, Pain from excitation of identified muscle nociceptors in humans, Brain Res, 1996, 740, p. 4-412. Pedersen-Bjergaard U. et al., Algesia and local responses induced by neurokinin A and substance P in human skin and temporal muscle, Peptides, 1989, 10, p.1147-52. Sörensen J. et al, Hyperexcitability in fibromyalgia, J Rheumatol, 1998, 25, p. 152-5. Whitty C.W.M. et al, Some aspects of referred pain, Lancet, 1958, 2, p.226-31. Witting N. et al, Intramuscular and intradermal injection of capsaicin: a comparison of local and referred pain. Pain 2000, 84, p 407-12. Ari B.Y., Low Back Pain with Referred Pain, http://www.spine-health.com/conditions/lower-back-pain/low-back-pain-referred-pain. 15-04-2012. Da silva J.A. et al, Wool, Rheumatology in Practice, p. 12.5.
van Cranenburgh B., SCHEMA’S FYSIOLOGIE, Elsevier/De Tijdstroom, Maarssen, 1997, 53;65;70.